A loan of $1,000 helped to buy a machine for cutting wood, and other needed tools so he can increase his production. Issa, who appears in the photo, is a 22-year-old married man who lives with his family in Bethlehem, West Bank. He tries hard to make his family live in best conditions and cover all their needs. Issa works in carpentry where he earns a low income, this income is barely cover all the basic needs of family. He wants to improve his work in order to enhance his income. 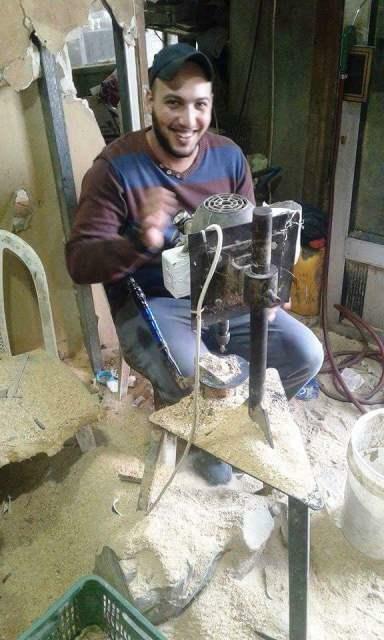 Issa went to Palestine for Credit and Development FATEN to request a US dollar loan to buy machine for cutting wood, and other needed tools that helps him in increasing his production. He hopes you will help by funding his loan. It targets youth in a region where young people often are unable to find jobs. This loan is helping support a borrower who is 35 or under. Because many young people lack business experience or established credit histories, it can be even more difficult for them to access financial services. By funding this youth loan, you are expanding opportunity for a young person with limited resources.